The new index shows that Rwanda has, for the past 25 years, achieved unprecedented progress in gender equality on economic transformation, social transformation and transformational governance. It, however, reveals that there are prevailing challenges. “Rwanda is strongly committed to promoting gender equality. In our assessments as GMO we find that different institutions have put in place gender sector strategies. This really shows commitments in place to promote gender equality in our country,” Rose Rwabuhihi, the Chief Gender Monitor said. Rwanda’s legal and conducive policy environment has greatly contributed to the realization of gender equality and empowerment of women across different sectors. The research has shown that there have been tremendous achievements in promoting gender in different sectors including education, health, economic and governance. According to the research, there has been consistent stability of gender parity in the education sector. In 2013, enrolment in primary education was at 49.3 per cent for men and 50.7 per cent for women. In 2015, this number was at 50.5 per cent for men and 49.5 per cent for women. The enrolment for Technical and Vocational Education and Training (TVET) increased – 43.8 per cent for female and 56.2 per cent for male. However, boys and men dominate in well-paying trades such as carpentry, construction and motor mechanics while girls enrol in soft trades like tailoring and hairdressing. The research also indicates that there has been impressive enrolment of girls in science studies. The number of girls enrolling in Science, technology, engineering, and mathematics (STEM) is increasing due to various initiatives such as Miss Geek, TechKobwa, and WeCode programmes, among others. On key indicators, Rwanda has made sure that women and girls who were traditionally marginalised get increased access to finance, own land, get employment opportunities in both public and private offices, as well as take part in science education that was previously deemed for men. For instance, women currently own more land (24 per cent) than their male counterparts (14 per cent), individually. Married couples who own land stand at 58.3 per cent. 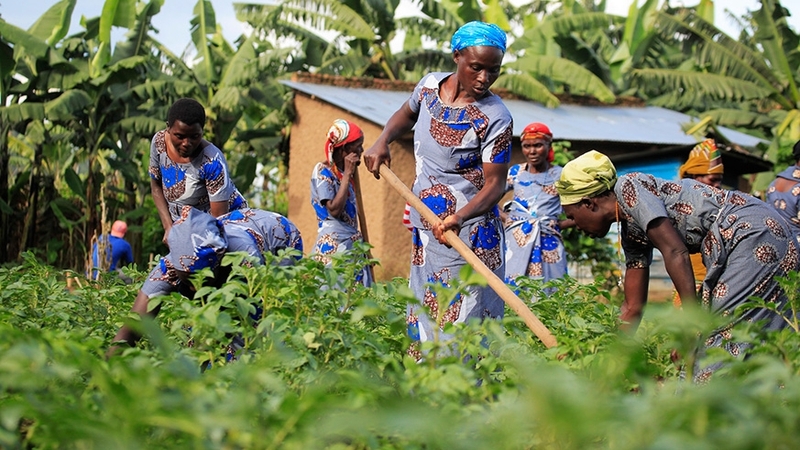 Land is considered the main asset for production and investment, and the report argues that land ownership in that sense has been instrumental in contributing to women’s access to finance. According to the index, women’s access to land tremendously contributed to their control over productive resources and access to loans using land titles as collaterals, highlighting that land contributed to 38 per cent of women’s access to credit. Generally, agriculture, industry and services continue to be the dominant sectors that provide employment opportunities for men and women at 39.5 per cent, 18.8 per cent and 41.7 per cent, respectively. However, there are significantly fewer women who access agricultural loans (25.5 per cent) than men (74.5 per cent), despite the sector employing more women (54.6 per cent) than men (45.5 per cent). While this is impressive, Jacqueline Muhongayire, the Member of Parliament, says it has been a long journey to achieve gender equality and women empowerment. “We (women) were few in the parliament and other leadership women. In 1995, we were only twelve female MPs out of seventy parliamentarians which represented only 12 per cent,” she notes. The female senate highlights that it was hard at the time for many members to understand why gender equality was important or passing a law that gives equal rights to women. “Giving such opinions was difficult. The gender equality and women empowerment first resulted from the highest political will,” she adds. Currently, there are more women in parliament than men. There are 50 per cent female ministers, 45.2 per cent districts’ councils, 66.7 per cent vice mayors and social affairs, 49.7 per cent in judiciary, and 44.3 per cent of community mediators. Marie Goretti Mbonimpaye, a former Gacaca court judge is one of the few females who started with Gacaca courts. “I am one of the judges whom people entrusted because they knew me as an honest parent. I joined other male judges who also bestowed me with trust and nominated me as Kanombe Gacaca Court President. The committee was made up of six women and they all believed that we (women) were able,” she recounts. Mbonimpaye, currently a mediator in Kabeza cell, adds that this inspired her to accomplish her core duties until Gacaca courts ended. On the other side there is ACP Teddy Ruyenzi, the first female Formed Police Unit Contingent Commander (UNMISS- Darfur). She currently heads contingent of 160 police peacekeepers from Rwanda, deployed under the United Nations Mission in South Sudan. “We joined our male colleagues, we have been both been trained and empowered to this extent that the country appoints a female officer to oversee the contingent in its peacekeeping deployment,” she notes. It is stories like these that genuinely reflect the journey that the country has moved to promote gender equality and significantly allow women to be active actors in all aspects of the economy. Rwabuhihi recalls the 1995 International Conference of Beijing held in China on gender equality between men and women, saying this was a basis for Rwandan to step up efforts aimed at promoting gender equality. “Rwanda was represented at the Beijing conference on gender equality. For those who remember the secretariat that we formed in Rwanda as part of implementing what we had agreed in China is what, later became the Gender Monitoring Office,” she noted. Gender Monitoring Office (GMO) is now implementing all the programmes aimed at promoting gender equality and women empowerment. This very research was conducted by GMO. Rwanda’s commitment to promote gender equality is enshrined in the constitution. It promotes principles of gender equality and women’s rights and provides for the minimum 30 per cent quota for women in all decision-making organs. Edouard Ngirente, Rwanda’s Prime Minister, the country’s efforts to achieve gender parity and women empowerment are reflected in the many legal structures that have been put in place. “Rwanda established a political system and put in place a number of laws aimed at increasing capacity of all Rwandan women and removing barriers to enable them to proactively take part in socio-economic activities,” he said. This includes, among others, Vision 2020, National Gender Policy 2010, Sector Gender Mainstreaming Strategies, Girls’ Education Policy 2008, and the National Policy against Gender Based Violence 2011. The research indicates that males continue to dominate the labour force due to having sufficient resources and relevant skills to engage in productive employment as opposed to females. There are fewer females who are in managerial positions than male – 34.1per cent for females and 65.9 per cent for males. There are only 33.5 per cent females who are chief executive, senior officers and legislators and only 34.5 per cent who are administrative and commercial managers. The index attributes the difference to the fact that high positions are stereotypically considered by society to be more appropriate for males. Other factors that impede women from occupying senior positions include limited mobility due to social responsibilities (unpaid care work), the educational level as well as access to and control of productive resources. This reflects the need to devise special measures to promote job creation among youth, especially female entrepreneurs. There is still low Female representation in local Government, security organs and regional and international cooperation. For example, there are 23.3 per cent of female mayors, 11 per cent executive secretary of sectors. Gender based violence is similarly still a serious issue and reporting remains low due to factors like cultural, economic and ignorance factors, while reintegration of GBV victims in their respective communities remains a challenge.